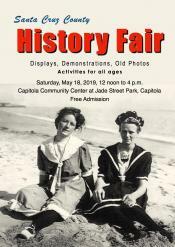 The ever-popular Santa Cruz County History Fair returns Saturday, May 18. Over twenty museums and historical societies from around the county will be sharing displays of old photos, artifacts, and information on local history. There will also be books for sale and activities for children. Bring your questions, curiosity, and perhaps an old photo to share, or just come and look.